DVD: A Future And A Hope! 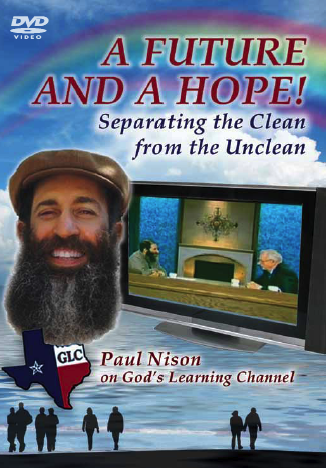 Separating the Clean from the Unclean (CLONE) | New Productss | Raw Life, Inc.
Part 1 As a young Jewish man, Author Paul Nison was a former atheist, and he is now a believer in Yahweh. This video explains how Paul was healed from a deadly disease and how that brought him to accept Yeshua as Messiah. In this video, he tells his encouraging story that will bring hope to everyone, no matter where you are. It covers *What New Agers Believe *How Atheists Think *How Eating Health Can Health Disease *Health and Diet According to the Scriptures *Yehsua's words versus the Church's words *Replacement Theology Part 2 It is on Paul's heart to share an un-popular but well-needed message about modesty amongst believers. Paul delivers this message with boldness and encourages believers to learn the truth about the connection between their appearance and their health, while also glorifying Yahweh.